Abstract: Transport over water plays an important role in the transport of goods in Europe. More than 37,000 kilometers of waterways connect hundreds of cities and industrial regions. Nowadays, the European Commission aims to promote and strengthen the competitive position of transport over water in the transport system and to facilitate its integration into the intermodal logistic chain due to its reliability, low environmental impact and ample capacity available for increased exploitation. The objective of this paper is to propose a new integrated framework for improving the efficiency of transport over water at both tactical and operational levels. 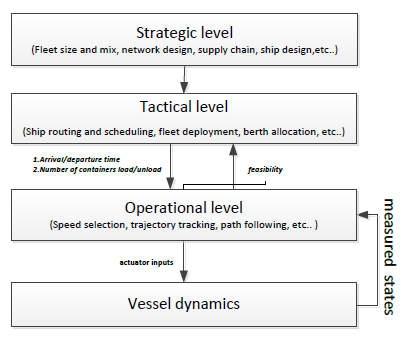 Research directions addressing main problem at these levels are discussed in this paper: vessel rotation planning and path following of waterborne AGVs. Moreover, this paper presents perspectives regarding future research directions to develop this integrated framework. Reference: S. Li, H. Zheng, R.R. Negenborn, G. Lodewijks. Coordination for efficient transport over water. In Proceedings of the 19th IEEE International Conference on Computer Supported Cooperative Work in Design (IEEE CSCWD'15), Calabria, Italy, pp. 389-394, May 2015.